Rare Pool Hall For Sale in Sacramento Area. Low Costs makes this a Great Money Maker! A great business! If you want a money making business with few employee headaches, low maintenance, plenty of fun, then you have to look at this business. 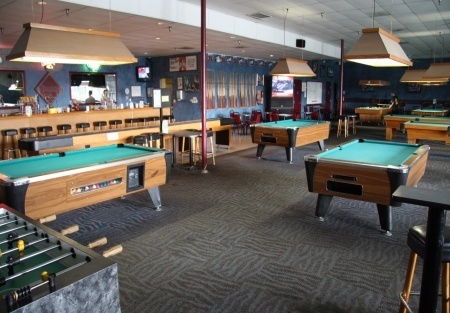 Operating for 12 years, this business has 17 billiard tables, a large bar area, darts, video games, shuffle board and much more. There is a solid customer and membership following that the owner has built with years of good service and quality products. The center just had a face lift and looks great. Despite the weak economy, sales remain strong and growing 23% in 2011 which in part is due to the great location, off a high traffic street and in a large retail center with major anchors. The Bar and Games room area's are immaculate. All tables, chairs, counter tops and restrooms are faultless. This opportunity is really Turn Key! This business sponsor's both Pool and Dart leagues. Teams come in on a regular basis and is a good revenue maker. Local businesses come in for "team building" on weekdays - another good revenue boost - typically a few times a month. They are also an anchor tenant in a 100,000 sq ft complex. 10 years in business! This shows how strong the business is especially over the past 3-4 years. LOCATION, LOCATION, LOCATION: Situated on a major main Hwy in a large center amongst many other restaurants and businesses, all within walking distance. This Pool Hall is highly visible from the road with large signage and ample parking. LEASE TERMS: The Lease terms make this Pool Hall an attractive operation too. Yes the all-in NNN/CAM rent is high at $9,200 a month, but it is only $1.27 Sq. Ft! This is a prime retail end-cap unit with 7,200 sq ft. Landlord will give more options so you come in with more than 10 Years! This business opportunity is in excellent condition. The equipment is all in excellent condition and with the high visibility make it a huge opportunity for a family to work together and enjoy the cash-flow to be made here. FOOD: There is also a kitchen with a full hood system for burgers, fries, and other various quick food items to offer the customers. There is a beer license as well. The kitchen has been a solid financial performer and there is always the opportunity for a new owner to increase revenue through expanded offerings especially at the Bar. GROSS PROFIT: What makes this business attractive is that once the business has reached the breakeven point, the profit made on each dollar of sales above breakeven is 80 cents! This business breakeven at about $240,000 of sales. So if you're good at marketing and getting people in the door and getting them to spend more money and play more games and you get the sales to $350,000, this business will earn you at least $80,000 of income. And at this low price, where can you find such a business? The Seller has stated that the business is strong and growing last year. So now is the time to take the Leap into Business Ownership and enjoy the freedom of working for yourself. REASON FOR SELLING: The Seller has too many outside business interests and admits being totally absentee and wishes to concentrate on his other businesses. The Price reflects a totally Turn Key business opportunity which will sell fast. The price is perfect for a quick sale. Sun - Thurs 11.00am - Midnight.